Alhamdulillah! We are about to welcome one of Allah’s greatest favors to His Ummah: the sacred month of Ramadan. May it be a month of blessings, forgiveness, and salvation for us all. Two Ramadans ago, we came to know that the Prophet Muhammad ﷺ was the essential servant (‘abd) of Allah (swt) through our theme “In the Footsteps of our Beloved”. Last Ramadan we came to know that he ﷺ is the essential knower of “Asma’ Allah Al-Husna (Allah’s Names and Attributes)”, and he exuded and connected to them on a human level in the most profound way. For this year, during the days and nights of Ramadan, we will continue to explore, learn, and internalize his ﷺ perfect character by coming to know his ﷺ Prophetic Relationships: One Interaction at a Time. Over the course of his (ﷺ) noble life, our beloved (ﷺ) occupied different roles, including that of a husband, father, leader, friend, mentor, among many others. Despite playing all of these roles, he ﷺ fostered a culture among his ﷺ companions to be fully present with one another, to make one another feel special, and to be honest and truthful with one another. During this blessed month of Ramadan, we will strive towards a community that interacts in this manner – with love, service, advice, care, vulnerability, thoughtfulness, concern, and all of the beautiful characteristics that the Prophet ﷺ fostered in his ﷺ community. Our intention, as Muslims, is to beautify our own relationships and interactions by learning about those of our beloved Prophet ﷺ. Insha’Allah, this Ramadan, the Friday Khutbahs, Taraweeh Khatiras and weekly classes will be means to beautify our relationships and interactions. When we realize the content of his ﷺ character and manifest it in ourselves, we will have the ability and tools to transform ourselves into a Prophetic Community. May Allah (swt) make us a people who realize Prophetic Relationships: One Interaction at a Time. May Allah (swt) bless us in this month of Shabaan and allow us to witness the month of Ramadan. We ask Him (swt) by all of His Names & Attributes to make the month of Ramadan a means for us to realize a Prophetic ethos within our community. May He (swt) allow us to foster strong relationships through sincere interactions. May He (swt) bless our scholars and teachers. And may He (swt) send an abundance of prayers and peace upon our beloved ﷺ. How does the ISBCC determine the days of Ramadan? The ISBCC follows the Fiqh Council of North America in its fatwas on the timing of Ramadan and Eid. To understand their methodology for determining the days of Ramadan, please click here. 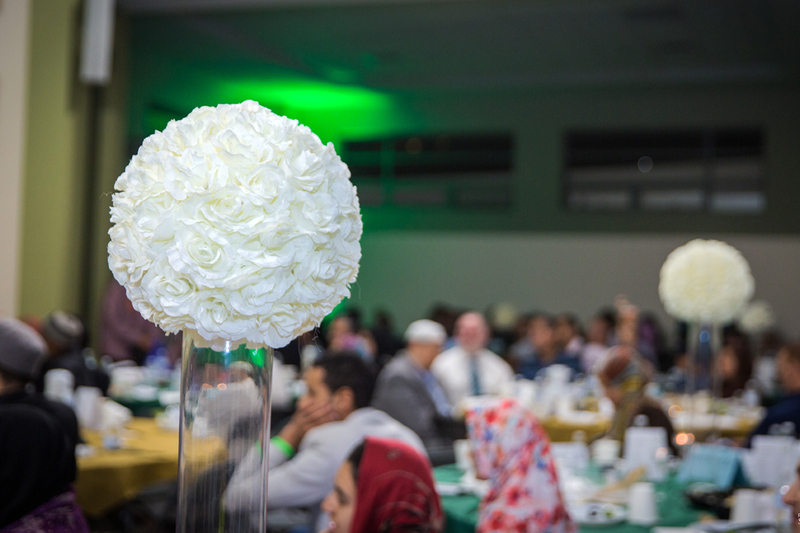 We invite you to join members of the community, our board and our staff for a special evening of celebration and support of our masjid at ISBCC’s Annual Fundraising Iftar on Saturday, May 11, 2019 in the blessed month of Ramadan. Additional details of this special evening will follow. Please save the date. So how do we obtain Allah’s love and acceptance? It is by being the most beneficial to others. With the blessed month of Ramadan fast approaching, it is the perfect opportunity to bring so much benefit to people – to our ISBCC community. Let us all take advantage of this month by facilitating Ramadan for our ISBCC brothers and sisters and ask Allah (swt) to accept from us, reward us, and make us among those He loves and grants acceptance to, ameen! Vounteer at the ISBCC as a Ramadan Responder! Join us for a volunteer orientation on April 27th from 4 pm to 7 pm, insha’Allah! Make sure to fill out the volunteer form, first. Shortly after the Prophet ﷺ received his first revelation (Iqra! ), he ran, fearing for himself, to his wife Khadija, may Allah be pleased with her. “Cover me [with the cloak]! Cover me!”, he requested of her. Allah (swt) revealed, shortly thereafter, verses, commanding the Prophet ﷺ to offer the nightly prayer as a means to strengthen his bond with Allah (swt) and bring comfort and confidence to his heart. If you are someone who has been experiencing self-doubt, who is faced with what seems like insurmountable obstacles in your life or who wants Allah (swt) to use you for a higher purpose, join us in worshipping Allah (swt) with your fellow believers during the quiet hours of the night and listening to the recitation of the Holy Qur’an. We will be lead in Taraweeh this year by Shaykh Abdelmeneim Mukassabi. Shaykh Abdelmeneim is a renowned imam in the greater Boston community with decades of experience and serves as the headmaster of the ISBCC Quran School. He holds numerous ‘ijazas (independent certifications) in Quranic recitation as well as tafsir (exegesis). In addition, Shaykh Abdelmeneim is an expert in rasm (writing) of the Qur’an, a scholar of Maliki fiqh (jurisprudence), and a mufti in Islamic inheritance. We are honored to have him lead taraweeh at the ISBCC, alhamdulillah. Shaykh Abdelmeneim will lead us through the entire Qu’ran over the course of the blessed nights of Ramadan. Taraweeh will start immediately after ‘isha prayer and end approximately at midnight. We will pray 8 rakat and end with a beautiful dua (supplication) to Allah during witr prayer. Join us for this blessed ibada (worship)! If you would like to earn a reward for every time someone prays during taraweeh, please donate for all the costs associated with our Taraweeh prayers. Please consider leaving the ISBCC parking lot for community members who are elderly, disabled, sisters, and/or families with young children. We ask that you make every effort to carpool and use this Ramadan as an opportunity to build new and deep relationships with your Muslim brothers and sisters. Should you require parking, please consider leaving the ISBCC parking lot for community members who are elderly, disabled, sisters, and/or families with young children. We have reserved Lot #2 at Roxbury Community College, between the hours of 6 pm and midnight. (1) Drive SOUTH on Columbus Ave (keep Roxbury Community College on your left) for 0.4 miles. Please do not park illegally, block driveways, or lot entrances – cars will be towed at owner’s expense. Please do not leave valuables in vehicles, ISBCC is not responsible for any damage in lots/streets. Seerah Sundays will be an opportunity for the entire community to learn about the life of our beloved ﷺ. Shaykh Yasir will continue teaching about the life of the prophet ﷺ as he has been doing every Tuesday night at the majlis. During these gatherings, we will delve into the seerah, the life of the Prophet ﷺ. Community members will learn the history of our beloved ﷺ, from the Arabian peninsula before the Prophet’s ﷺ birth until the events following his death. Through studying his ﷺ life, we will learn how to emulate his ﷺ behavior and delve into the deeper lessons related to how he ﷺ interacted with the people around him ﷺ. While Shaykh Yasir will be referencing the text Revelation by Meraj Mohiuddin and others, there are no required texts. All are welcome. We encourage our community members live up to this example; to spend from the wealth Allah has given them during this month abundantly. Give in order to help those who cannot give, give to support all the various causes of justice, and give to support this House of Allah – the ISBCC. Show your attachment to this House of Allah – the ISBCC – by giving generously and by joining us in practicing the important act of worship of giving sadaqa (charity). Jazakum Allahu khairan (May Allah reward you) for choosing to give to His house. All donations are tax-deductible. You may make a one-time gift or become an ISBCC Sustainer by giving monthly. Please select from one of the following options. If you’d like to give towards a specific part of the ISBCC, such as Facilities, Spiritual Development Programming, Service Initiatives, etc please simply indicate that in the comments field.